The British Columbia Green Buildings Map quantifies the jobs in the industry and pinpoints where energy-efficient homes and buildings are located in the province. The Pembina Institute has updated the map for 2017. The latest research puts the number of jobs in the green building sector at 31,700 — up from the 23,200 counted when the map debuted in 2015, mostly due to growth in larger projects. Meanwhile, the number of green buildings in B.C. has risen to 20,100, with more than 750 of these built in the last two years. The new B.C. government can ensure the green building sector continues to thrive by investing in programs that will accelerate the upgrading of our existing homes and buildings, and make constructing low-carbon, ultra energy-efficient buildings the norm. B.C. needs a comprehensive strategy to set a course for the building sector to help meet the province’s legislated 2050 climate target for carbon pollution. 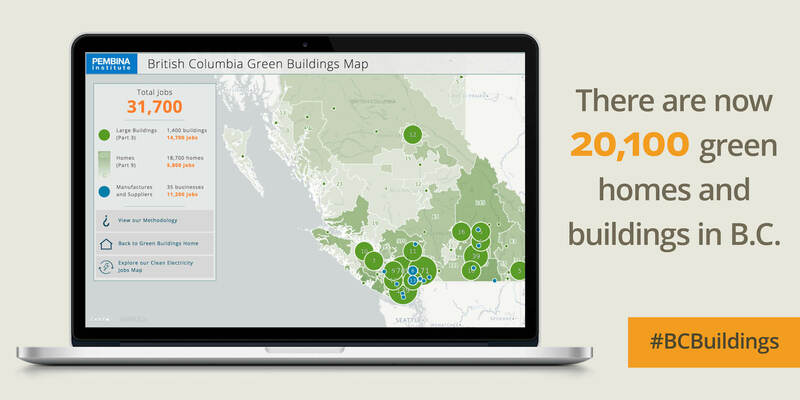 Explore the updated map to learn more about B.C.’s growing green building sector. Tags: British Columbia, Provincial Policy, Energy Efficiency, Urban Planning, Buildings, Economics. B.C. is at risk of being left behind. The Pembina Institute outlines five key priorities for building the clean economy. Learn about B.C.’s competitive green-building sector by exploring the map. Achieving market transformation towards net-zero buildings in British Columbia will require a multitude of policy tools, including incentives, funding, training, improvements in compliance and enforcement, benchmarking, a strong carbon tax, and building regulations. This paper focuses specifically on the role and history of building regulations in accelerating energy efficiency. Our perspectives to your inbox. Donate Together, we can lead Canada's transition to clean energy.